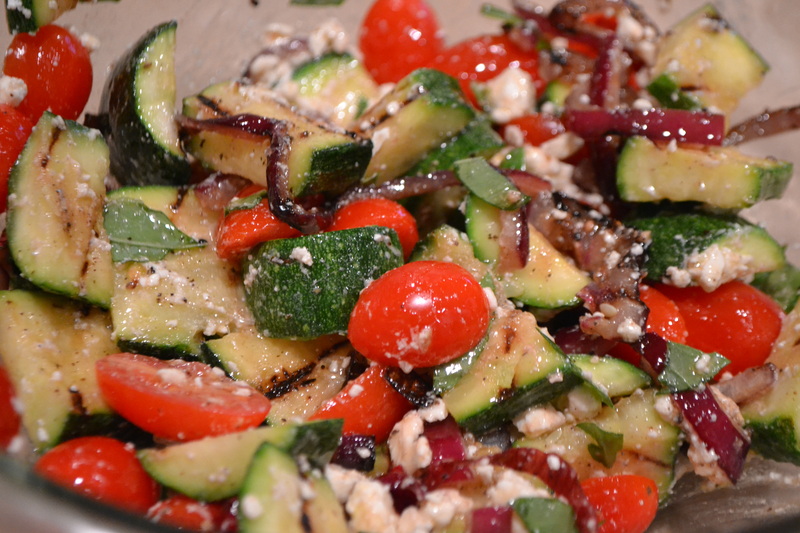 grilled zucchini salad | Is there any wine left? I love zucchini. It is my favorite, favorite, vegetable. Even more than green beans. I don’t love it more than tomatoes. But since they are technically fruits, I feel okay saying I like zucchini best of all the vegetable family. But it kind of throws me to say that tomatoes are not vegetables. Anyway, when I was a kid, I always wanted zucchini with dinner. But Jenny hates it. She likes broccoli, the one green thing that I hate. Though I should mention that at the time, I hated all green things except for zucchini. Thats a whole other story. All that to say, this salad combines my favorite things. It is good. Hearty. It could easily be a filling lunch. I don’t think it could stand on its own as dinner. But that is because I am not a vegetarian. So to make this awesome salad, heat a cast iron skillet over medium-high heat. Coat the zucchini slices in salt, pepper, and olive oil. Grill the zucchini on each side for 3-4 minutes, until slightly softened and browned. Remove the zucchini to a cutting board and cut the slices into 1/2″ wide pieces. Coat the red onion slices in salt, pepper, and olive oil and grill each side for 1-2 minutes in the cast iron skillet. Remove from the pan and roughly chop. 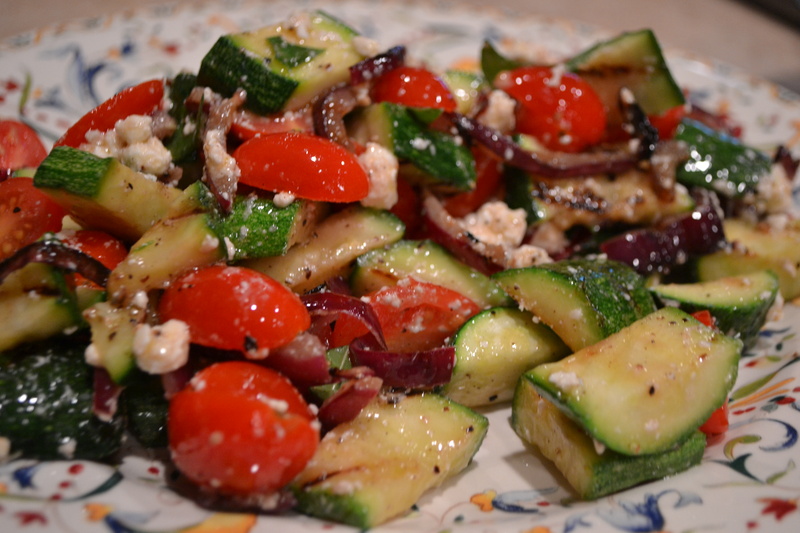 Combine the zucchini, red onion, tomatoes, basil and feta in a medium bowl. In a small bowl, mix the olive oil, red wine vinegar, salt and pepper well then pour over the vegetable mixture. Toss to coat and serve immediately. The last few bites of this salad are the best since the veggies have been soaking in the vinaigrette. Fight your husband for these bites. Heat a cast iron skillet over medium-high heat. Coat the zucchini slices in salt, pepper, and olive oil. 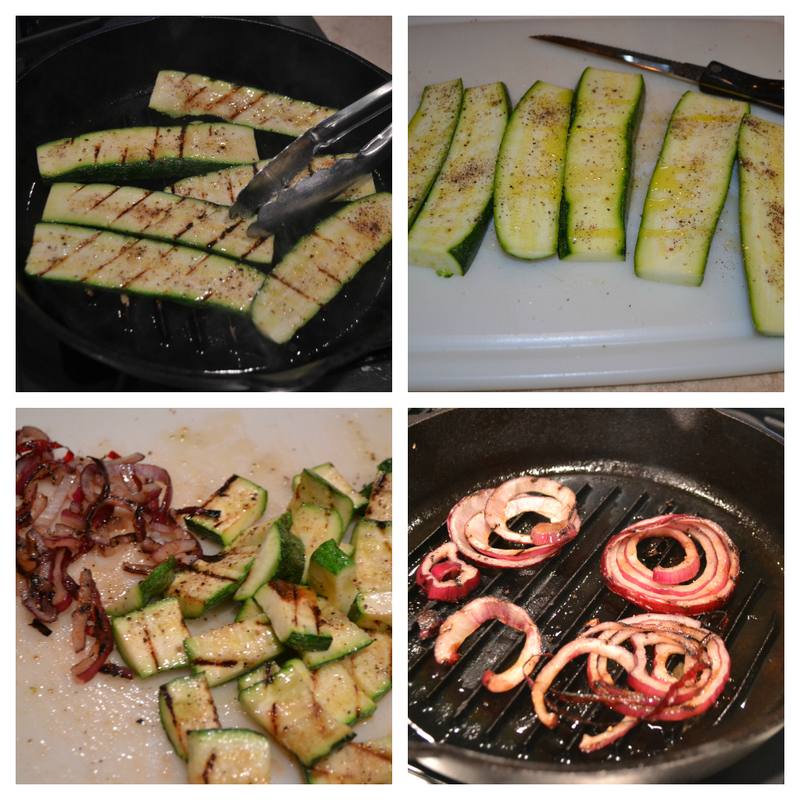 Grill the zucchini on each side for 3-4 minutes, until slightly softened and browned. Remove the zucchini to a cutting board and cut the slices into 1/2″ wide pieces.